The Maha Ganapati Temple is the eighth Ganesha Temple to be visited during the Ashta Vinayaka yatra, the lord's shrine is at Shirur taluka at Ranjangaon and 50 kms away from Pune. This temple is facing east, and bears a distinct resemblance to the architecture reminiscent of the 9th and 10th Centuries. 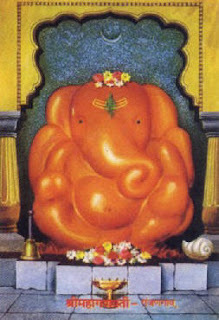 The temple has been designed in a way that the sun rays fall on the Idol face.Mahaganapati is portrayed, seated on a lotus, flanked by his consorts Siddhi and Ridhi. The temple dates back to the period of Peshwa Madhav Rao.The trunk is turned on left side. Shivshankar had killed here the demons Tripurasura and Grutsamadputra. It is said that the original idol is hidden in the basement, having 10 trunks and 20 hands and is called Mahotkat, however, the temple authorities deny existence of any such idol. Legend has it that a demon by name Tripurasura,caused suffering to all beings in the heaven and on earth.On hearing the pleas of the Gods, Shiva intervened but he realized that he could not defeat the demon. Later on listening to Narad Muni's advice, Shiva saluted Ganesha and then shot a single arrow which destroyed the demon and Tripura citadels. Shiva, the slayer of the Tripura citadels is enshrined at Bhimashankar nearby. In South India, a legend is commonly known that Ganesha broke the axle of Shiva's chariot, since Shiva was heading to battle the demon Tripurasura without meeting Ganesha. Upon realizing his act of negligence, Shiva met his son Ganesha, and then proceeded to battle against the powerful demon and achieved the victory.